Emma J. Ray, b. 1859 and Lloyd P. Ray, b. 1860 Twice Sold, Twice Ransomed: Autobiography of Mr. and Mrs. L. P. Ray. Twice Sold, Twice Ransomed: Autobiography of Mr. and Mrs. L. P. Ray. Chicago, Illinois: Frees Methodist Publishing House, c1926. African American clergy -- Washington (State) -- Seattle -- Biography. African American Methodists -- Washington (State) -- Seattle -- Clergy -- Biography. 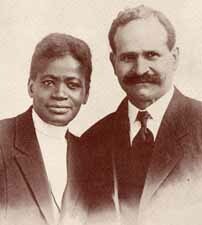 African American missionaries -- Washington (State) -- Seattle -- Biography. Ray, L. P. (Lloyd P.), b. 1860. Ray, L. P., Mrs., b. 1859. Temperance -- United States -- Biography. Rare Book, Manuscript, and Special Collections Library, Duke University, provided the text for the electronic publication of this title.